Treat Your Family to a FREE Dining Plan. Book by July 31, 2013. Don’t let this offer slip away. This is the best deal of the year! 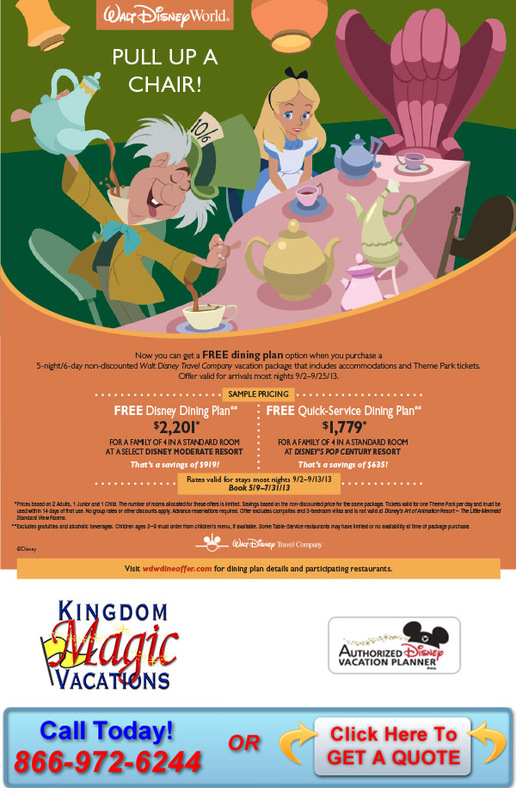 Get a FREE dining plan when you purchase a non-discounted 6-night/7-day Magic Your Way room and ticket package at select Walt Disney World® Resort hotels, valid for arrival most nights September 2 – September 25, 2013. You can treat your family to a special offer: a great Disney vacation complete with meals! A package must be purchased that includes a minimum of 3 nights accommodation at an on-site Walt Disney World resort and a minimum 2-day Base Ticket at full price. Get around with ease – thanks to complimentary motorcoach transportation between Orlando International Airport and your Disney Resort hotel AND throughout Walt Disney World® Resort, as well. Experience amazing entertainment for everyone – fantastic pools included! This entry was posted in Dining, Disney Dining, Disney Discounts, Disney Resorts, Disney Restaurants, Disney Special Offer, Walt Disney World and tagged amazing entertainment, disney resort, Disney vacation, disney world resort, extra time, family and friends, motorcoach transportation, nights accommodation, orlando international airport, pools, quality time, resort hotel, resort id, special offer, theme park admission, ticket package, walt disney, Walt Disney World, Walt Disney World Resort, walt disney world resort hotels on May 9, 2013 by John Donahue. Now that the Lion King Wing of Disney’s Art of Animation Resort it open we thought we would take a look back at some of the recent videos leading up to this point. Explore each one of these videos to discover all the exciting details Walt Disney World’s newest Resort Hotel has to offer. The story begins here in the Finding Nemo Wing. In addition to offering family suites, the Finding Nemo wing features the largest resort swimming pool on property – complete with an underwater soundtrack. Check it out dudes and dudettes! Guests with larger families now have a new place to stay, swim and sleep at the Walt Disney World® Resort in Florida. The all-new family suites at Disney’s Art of Animation Resort can accommodate up to six people, providing just the right amount of extra room to spread out. Check out this video to see the ingenious way a dining table converts into a nifty bed! The new “Cars” wing at Disney’s Art of Animation Resort lets you sleep as well as play in the world of Lightning McQueen and his high-octane pals. The family suites also provide extra room to spread out. Take a look! You can have a roarin’ good time at “The Lion King” wing now open at Disney’s Art of Animation Resort at the Walt Disney World® Resort in Florida. Sleeping up to six people, these family suites are magical spaces featuring favorite characters and lots of hidden details. Check out the paws! This entry was posted in Disney Resorts, Video, Walt Disney World and tagged dining table, disney world resort, dudes, dudettes, extra room, finding nemo, hidden details, lightning mcqueen, lion king, new cars, offering family, pals, paws, resort hotel, swimming pool, table converts, walt disney, Walt Disney World, Walt Disney World Resort, walt disney world resort in florida on August 17, 2012 by Rick Howard.